Hello, so a quick disclaimer is that this is not my own build and rather it's my brother's. He had a few problems making the setup work, but I can confirm that this is absolutely plug and play. The issues encountered is the main reason why I wrote this thread and it's pretty big and really it applies to all implementations, not just this one. So right to the point, the problems were hardware related, and was the result of a faulty akitio unit - specifically the 12v power management. You can see in the pictures http://imgur.com/a/qLlHp . If you look closely you notice the small chip that was probably caused by a short in the system, or previous owners drawing too much power from the PCIe (note this was bought brand new, so you wouldn't really expect previous owners other than yourself, but with shifty websites you can never know for sure). Many times if your implementation doesn't work, people assume that it is software related. So sometimes you have to be willing to assess the situation further, and realise that maybe the purchase itself was the underlying issue, and for us this was definitely the case! I won't go into too much detail on how certain retailers are horrible, but take note that it can happen. I will have imgur links below for those interested in my full assessment, it is pretty important as it shows how hard it can be to pinpoint hardware faults (i.e. is it the gpu that's faulty, the power supply? the box itself? certain combinations?). Definitely a big worry because you only get 14 days at best to troubleshoot and then return, but luckily we acted in time. Anyways so back to the main topic, we managed to make it work by ordering an akitio box from span.com (we live in the UK), and returning the one we originally had, it really was as simple as that. He bought a faulty enclosure from an Italian company, and returned it for a full refund. If he didn't have as much patience he could've returned the laptop and assumed that the 9360 was not compatible, but I urge you do not make these mistakes, because they are definitely compatible. The setup is plug and play and involved no modifications. You get a clean setup with no hassle of modding the chassis or previous desktop experience. So just get the laptop, akitio, power adapter, gpu, and you're good to go. Of course in the future you may opt for a better gpu, and that is entirely possible. I mainly made the thread in hope to bring awareness of faulty hardware, but if I were to quickly skim through this, I can say that I tested two games both on the internal screen, Planetside 2 and Robocraft. No real benchmarks or anything, but personally I own a 9350 skylake model, and the performance is exactly the same as my brother's kabylake model shown here. So as to say expect 30 fps in highly populated areas of Planetside 2, and 45 in medium fights, 60 small fights or 90 when nobody's around. You have to upscale a 1600 x 900 resolution though, the gpu struggles with the QHD+ display (I get a 5°C temp increase and 45fps this way). The bottleneck however is mainly CPU based and understandable so for planetside 2, so that's one reason that may draw you to this XPS rather than the 2 in 1 model. Robocraft is a light game and at 2560 x 1080 max settings you get around 80 fps as expected, but I did find it odd that whenever I go full screen, the game would drop to 30 fps, not sure if the game has trouble upscaling, but there's definitely something I don't quite understand here. When capping the framerate to 60fps using the in-game settings, there is something a bit off, I'm not quite sure what that is, generally in desktops the fps would float around 60, but the egpu build certainly hops between 50 to 65 when capped to 60 (a bit unusual, knowing it is capable of 80 fps). Now you could play Robocraft without an egpu and certainly reach 60fps. I don't play games often so I put up free to play games as an example. I recommend you only go 60fps for the internal screen though, knowing that it is 60Hz. You could do with fallout 4 at 30 fps, I'd assume this is what you'd get playing that game, generally I'm okay going 30fps for single player games. Again this is with internal display and taking note the performance hit due to the 2 lane XPS line. Temps for the laptop CPU stay stable at 60°C and I must say I am very impressed. This is what my desktop generally go around. 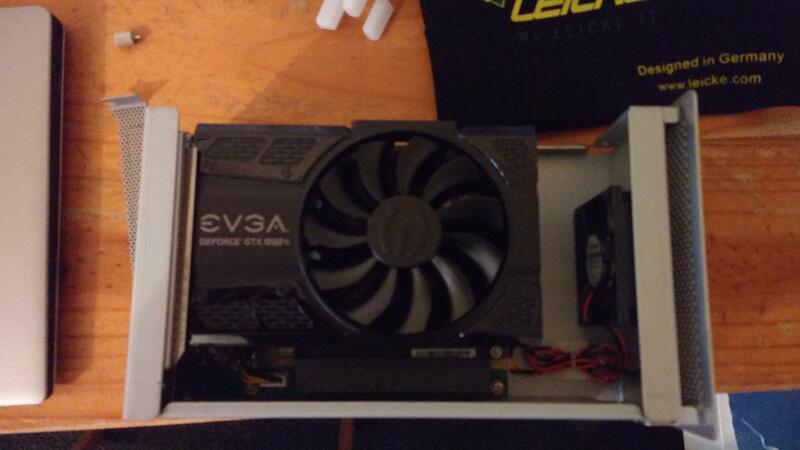 The GPU floats from 60 to 45° depending on load, but this is with the akitio case closed, not open. In order get these temps however: You have to disable turbo boost, and undervolt the CPU to -0.100V. Personally I prefer Intel XTU, but my bro finds throttlestop better with the freedom it has. In the end both programs give the same result. I wouldn't go over -0.100V (i.e. don't go -0.105V), this seems to be the blue screen limit for both the skylake and kabylake xps. Of course your mileage may vary, but for me and my brother the limit was a -0.1V undervolt, so likely you will have the same result. I can't stress how good this is, without the enclosure the temps get pretty high and the integrated GPU does a lot of work. Once connected however, your CPU will work less, and you will notice a massive improvement in thermals. Honestly playing robocraft without egpu sets temps up 70°C, while with egpu, you get around 55 to 60°C - it's a nice trade-off. Now I'm not saying that you shouldn't play without an egpu, just that you can improve temps by doing so. As a reassurance, this 9360 hasn't been repasted (we did not tamper with the internals), and nor does the fan spin below 70°C (I know weird, the fans only kick in at around 73°C). So if you manage to get the fan spinning full speed at 55°C, you may be able to reduce temps further (and please tell us! I'm currently trying to figure that one out myself). With these out the way, my recommendation is to buy from equip-u UK. The rest of the stuff can be bought from either Dell or Amazon. For my egpu setup, I ordered an akitio thunder3 box from equip-u at £280, it's a great deal here in the UK and it hasn't failed me yet. If you have any questions about equip-u, the guy there is very helpful and friendly, so buy from him! If you're like my brother - the renegade he is - you can buy from span.com for £320, more expensive but his akitio has definitely arrived faster (one day standard delivery) and with more packaging than mine, so I guess you pay for the slightly better packaging quality. If you ask me though, buy from equip-u, more value for UK buyers. You in the US? I would personally buy direct from the manufacturer in the case, but don't quote me on that as I'm not familiar with the deals going on in the US. Generally buy from reputable sources and ask questions! Seek for the better value. That said, I will finish off by giving my thanks to the amazing community here. I hope I helped you, I made this thread in sole purpose to aiding against faulty purchases. Do realise that sometimes akitio thunder3s or any other enclosures can turn out faulty, and if it does happen, use my guide as proof and support. Ok so everything's complete and edited now, thanks for the help, best of lucks! If you have any queries you can reply here or by email, I will be happy to answer. Thanks a lot for the detailed article. I'm looking for a eGPU for my XPS 9360 as well and have read many disappointing news online with that laptop actual TB bandwidth and lack of support for eGPUs. I haven't found any success story with Akitio Node. But your report is encouraging and it looks reassuring that Thunder3 setup is plug and play. I also see from your screenshots that Thunderbolt Software says eGPU is not supported, I'm guessing that's ok anyway? When I look at Thunder3 page on equip-u, the description says "This device is not designed for graphics cards". Do you know why? Am I looking at the same product? I might do a video showcasing the temps and in-game fps, and also the general stuff you'd expect in the device manager. Not right now, but hopefully in the near future. What is the fan speed and noise of EVGA GTX 1050 Ti SC GAMING on idle system?? The EVGA don't have fan 0db in idle??? Hey man, you probably have your answer by now - but if not, I can tell you that the fan runs 30% always according to CPUID HWMonitor. I can't quite tell which is louder, the GPU or the akitio fan, it does sound like a vacuum when closed though. Gigabyte cards are the ones to look for if you want 0% noise, they tend to adapt depending on load. You may also try using MSI afterburner to manually control fan speed, this might be worth checking if you want 0% on other cards. 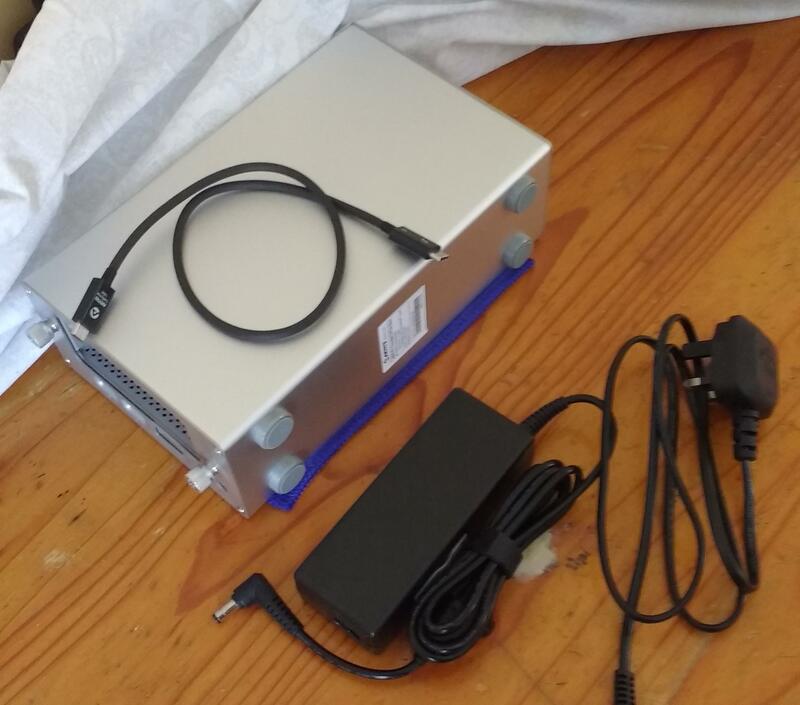 I wass surprised to read that you use only a 90W PSU. Does it work or would you recommend a bigger one? I think most of the people use at least 120W. Hello. 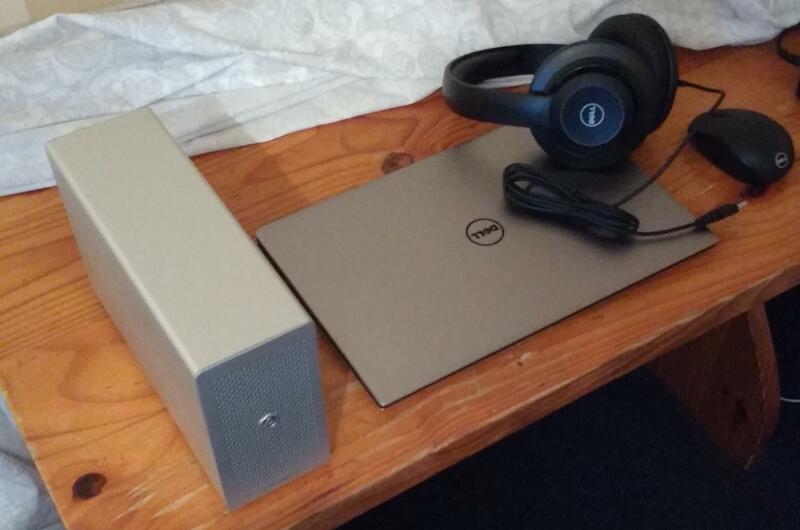 I currently have a Dell XPS 13 9360. 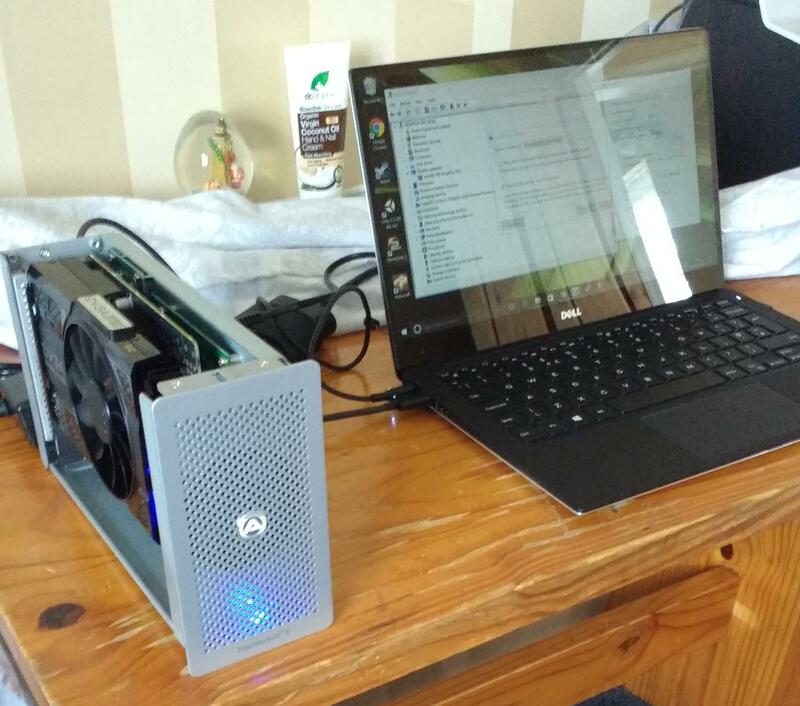 I have made an eGPU using a GTX 1050 and an Akitio Thunder 3 motherboard. However, when I play FortniteBR, regardless of my resolution, the FPS stays around 40-60. From what I've heard, the FPS should be 100+. I think something is bottle-necking my laptop, but I don't know what it is. Why do u recommend disabling turbo boost? Do u recommend it on the i5 model aswell?